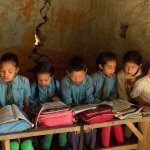 Schools across Nepal were dangerous, even before the earthquake that struck nearly one year ago. Had the quake not come on a Saturday afternoon – the only day when school is not in session – tens, if not hundreds of thousands of students would have likely lost their lives. 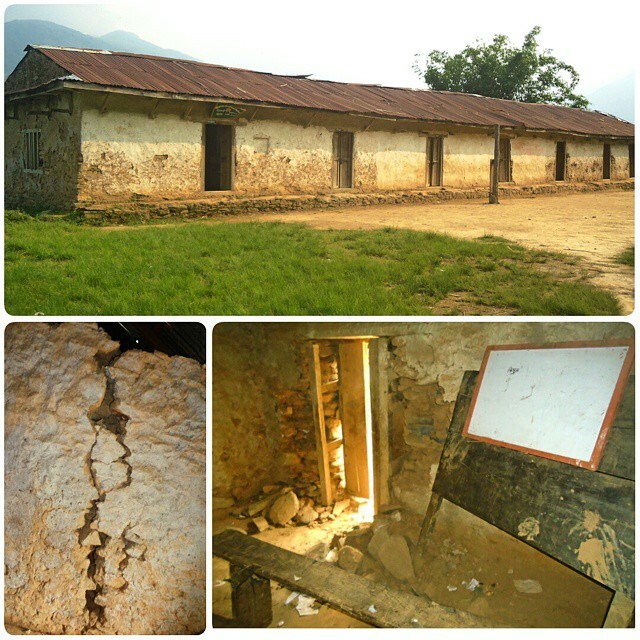 The photo above shows the cracked walls of the Janahit Primary School in the village of Rakha, and was taken before the earthquake. The building is now just a pile of rubble. We were planning to reconstruct this school building this year anyways, and shudder to think of what would have happened had children been in the building when the ground started shaking. In our very focused working area of 7 communities, the Earthquake damaged a total of 36 schools. This represents only a fraction of the devastation all across the middle-hills of Nepal. Besides schools, personal homes, drinking water, rural trails and other vital infrastructure have been severely damaged. Chandra School in Sungdel which is standing but is far too risky to use anymore. 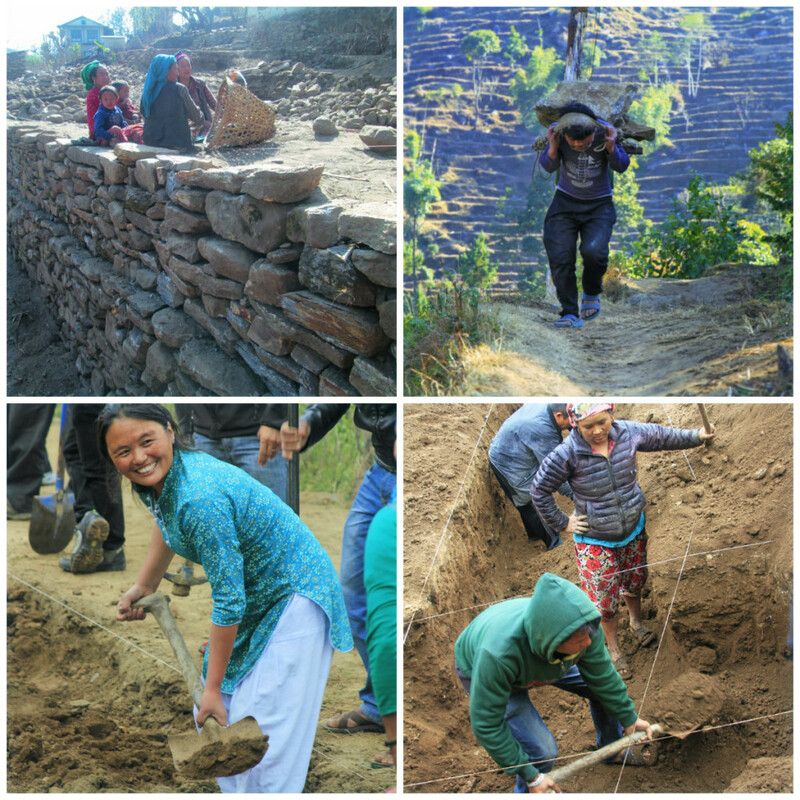 Our Earthquake reconstruction drive includes rebuilding the Janahit school, and 30 others in remote communities of Khotang and Solukhumbu districts. This will take us 3 years to complete. This year, we have broken ground on 9 schools already. 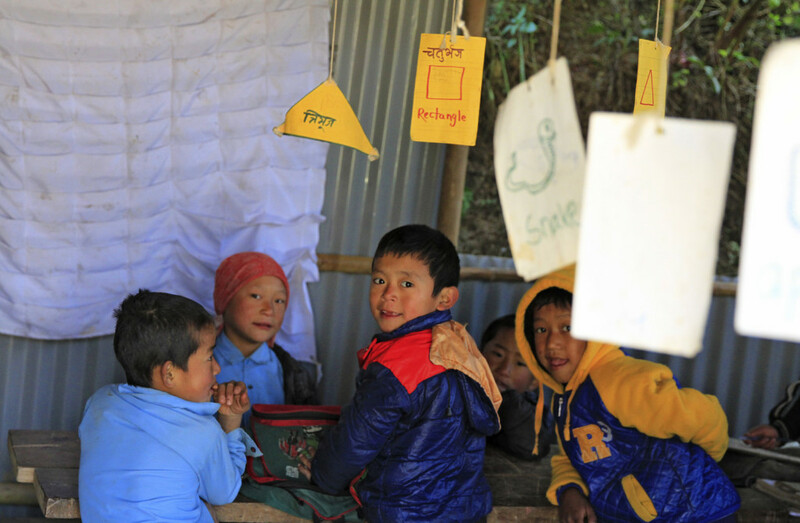 Immediately after the earthquake, we mobilized our resources to support continuation of classes in by constructing 40 Temporary Learning Centers, using roofing tin that can be recycled in the final school construction. As the rainy season was just around the corner, building TLCs enabled us to provide immediate shelter and continued education for over 2,000 students. 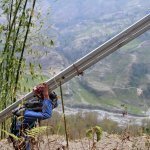 It is quite impossible in the Nepali hills to start any solid construction work during the monsoon which is one of the reasons our work for building permanent school buildings did not start immediately after the quake. Meanwhile, we worked on several earthquake safe school building designs to improve upon our existing model. Our technician Raj Kumar Rai, with consultation from various quarters, finalized three different school designs. Then, we faced an even more daunting task – getting approval from the Nepal Government. After the quake, the Nepal Government was overwhelmed with reconstruction work, and unfortunately mired down in political conflicts. After four months of diligent work, we finally received approval for our proven reinforced stone masonry designs and we immediately started working overtime to get all nine schools built before the monsoon rains arrive. 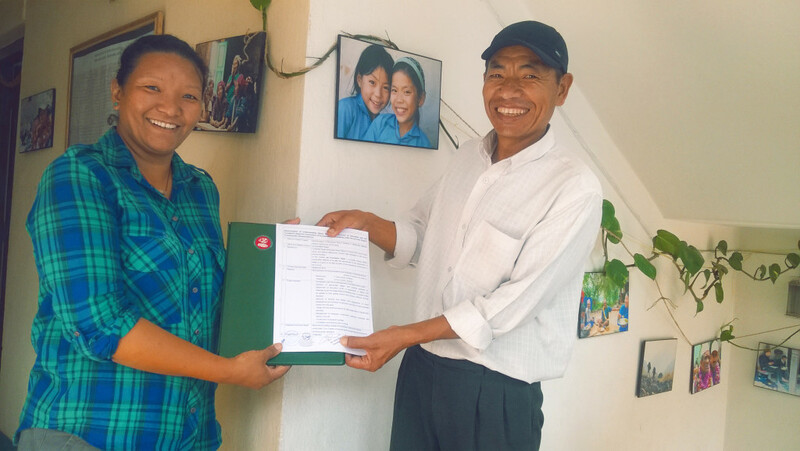 Rajkumar and Chokpa pose with the Government’s approval letter. Finally! Besides the bureaucracy, Nepal’s almost half a year long political instability together with the “unofficial blockade” in the Indo-Nepal border made it almost impossible for any real construction work to begin anywhere in Nepal due to acute fuel and material shortages. As the blockade has now been lifted, and we have the green signal from Government to go ahead, we have now started reconstruction in earnest. Work has started in all the 9 schools. Collection of local materials – wood, stone, aggregates have almost completed for all the school. Below short video shows community members donating their labor to collect stones for Hunga Lower Secondary School in Gudel. We have already finished all site preparation and the foundations for all 9 schools are dug. We are optimistic that we will have them all completed by the end of June. Our technicians, social mobilizer, and partner NGOs are working round the clock mobilize the community and to check progress on the schools. Our technicians are specially alert to monitor every aspect of the construction process and to uphold our strict quality standards – thus ensuring that the schools will be safe during the next quake. 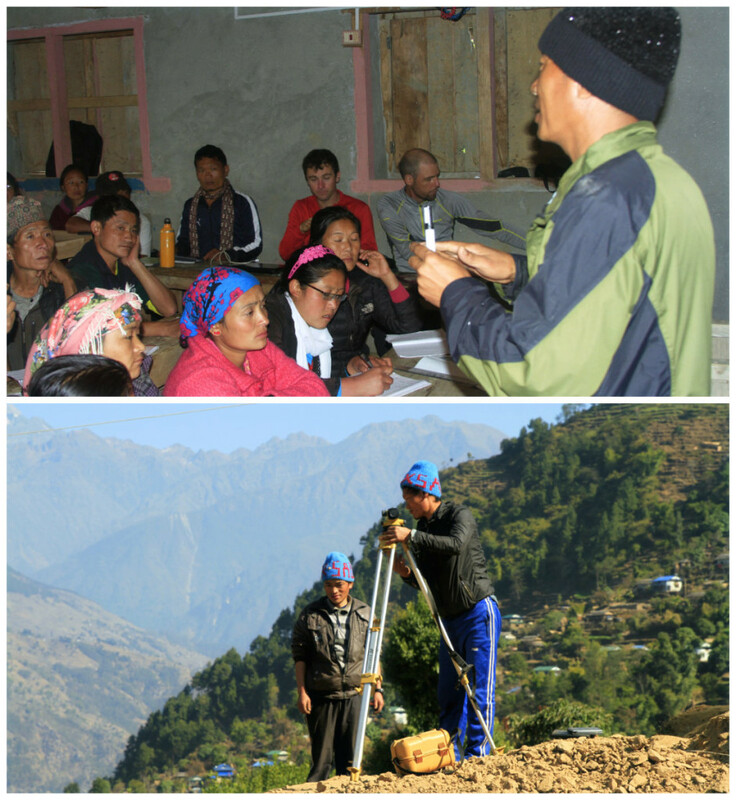 Top: Rajkumar gives orientation to the community about earthquake safe school building. Bottom: Chhatra, another of our technician, checks accuracy of ground excavation work. As a first and necessary step, our technicians trained community members and local dZi staff about the basics of earthquake safe technology. We focused specially on local masons and all dZi staff have now been taught to read basic engineering drawings, and to assist the local masons in interpreting the design documents. We are working day and night to finish these 9 schools so that we can start working on the next phase of reconstructing 11 schools in July. We have to thank all our generous friends and donors from around the world who has made it possible for us to respond to the need of the community so swiftly. Stay tuned for more updates about our school reconstruction work. 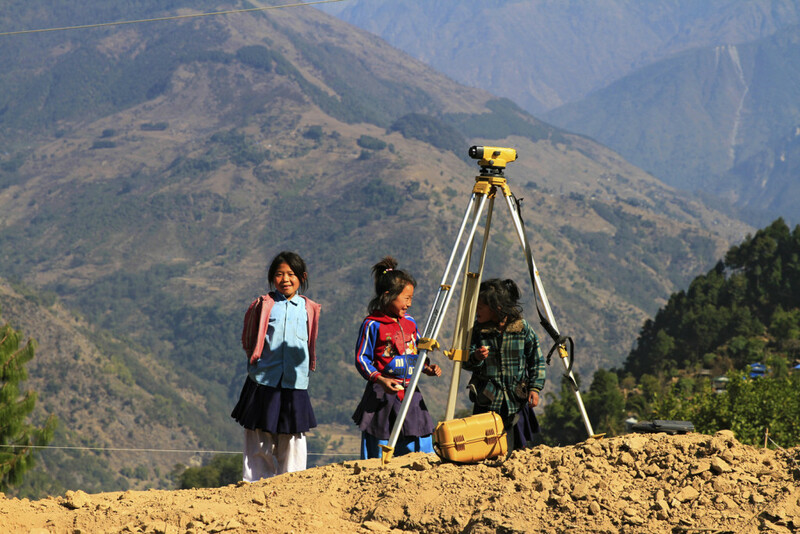 Girls in Gudel inspect their school building being constructed with much curiosity.